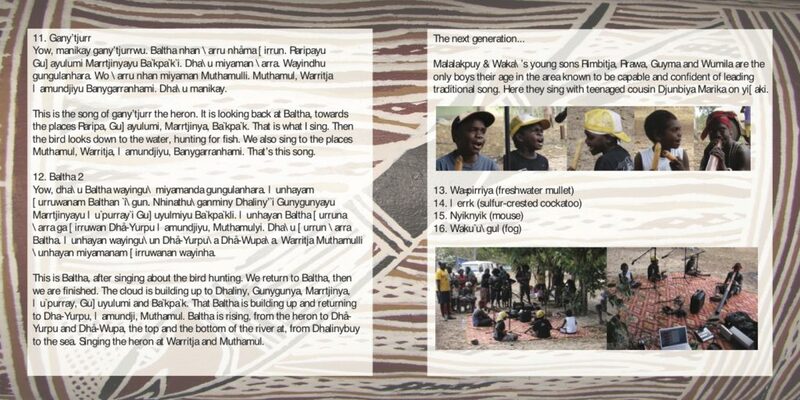 This post details the origins of The Mulka Manikay Archives CD series that documents songs of several Yolŋu clans of northeast Arnhem Land. A future post will go into greater detail about one of the recordings. You can find the albums from some didgeridoo sellers and all the usual online digital music retailers. Here’s a link to them on Amazon.com. In 2007, Buku-Ḻarrŋgay Mulka, the art centre in the remote Australian Aboriginal community of Yirrkala, launched a new multimedia wing: The Mulka Project. Mulka refers to the centre as a holding place of Yolŋu culture. The original grant applications sought mostly to create an archive of materials made by anthropologists, missionaries and other visitors to Arnhem Land over the years, managed and made accessible to the community by Yolŋu librarians. I luckily arrived in Yirrkala at the right time and with many of the right skills to become coordinator of this new project. Right away, I knew we needed to adjust Mulka’s charter. It wouldn’t just be an archive, but a production centre training Yolŋu to take the reigns of modern media to tell their own stories from now on. With my background as a musician and indie record label owner, it was a simple step to jump into making new audio recordings. We already started repatriating audio made decades earlier by outsiders. It was time for the community to make their own recordings of the current generation of singers. 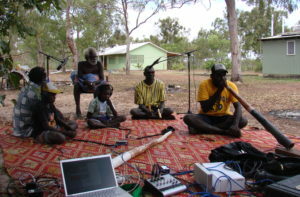 During construction and development of the new project, the Yothu Yindi Foundation offered support including the use of their recording studio at Gunyaŋara’. Their Contemporary Masters series of CDs recorded there featured Galarrwuy Yunupiŋu, Djalu’ Gurruwiwi and more. This seemed the obvious way ahead. We would record new albums of clan song there. The plan changed not long before the launch of the Mulka Project in mid-2007. Maḏarrpa clan leader Djambawa Marawili came in and poked around the new place just after I finished wiring our new theatre’s sound system. 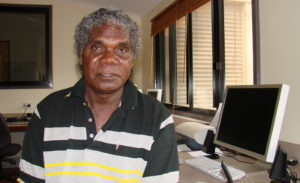 The voice of Galarrwuy Yunupiŋu from the Yothu Yindi Foundation CD Gobulu blared over the speakers. Djambawa listened for a moment and his face betrayed his thoughts. After her sudden passing and my sudden departure before the release of any of the recordings, the series became The Mulka Manikay Archives, which is much easier for non-Yolŋu minds and tongues to grapple with. I do however want the record to show that the original concept and the spirit of the recordings was definitely Rirrakay Yirralkawuy Yirralkaŋura. These are documents made in remote spots of Yolŋu singing the land. Of the three recording sessions I produced, Djambawa’s demonstrated this most clearly. As he and his clansmen sung of thunderclouds gathering over the ocean off of Yilpara, we watched it happening. Check them out now. If you’ve listened to them before, do it again. Know this time that these recordings are different. They’re not done in studios just to sell to the public. They weren’t done for an academic as part of his or her research. They are Yolŋu sitting on their own land, feeling what they’re singing with the intention of sharing with their families and future generations. Picture yourself on the beach at Yilpara or in the middle of Dhalinybuy and get lost in it. I’ve posted this before, but here’s a video clip from the Gurrumuru session. Dr. Marika, having worked in western academia and knowing many of the commercially available recordings of traditional Aboriginal music, had a chip on her shoulder that I adored. All the prior recordings of Yolŋu music included liner notes written by non-Yolŋu academics. All of them got some things right and some things wrong. Dr. Marika declared that our CDs would come with the most thorough documentation ever, telling deeper stories direct from the Yolŋu perspective for the first time. No essays by outside academics. The layout and artwork would include symbology related to the songs and ancestral connections. She wanted to show the world what comprehensive liner notes written and designed by Yolŋu intellectuals looked like. Sadly, this idea was dropped along with her name for the series after both of us were out of the picture. All the recordings are released with just a track listing and artist information. I’m not privy to the reasoning behind the decision, but I can guess. First off, it’s less work. A LOT less. Secondly, Dr. Marika was one of few Yolŋu who knew academia and who would have read liner notes about Yolŋu music written by outsiders. Not many Yolŋu have a context for these kinds of recordings in the outside world, and certainly few if any would have that drive that Dr. Marika had to create the best liner notes ever. The vast majority of Yolŋu would be happy with a recording with no liner notes at all. Ever since the introduction of cassette tapes, Yolŋu have passed around recordings of manikay. For most of them, new technology just means better quality for the recordings that they listen to with no need for any information. That said, I am grateful that the recordings have seen the light of day at all. The work of running Mulka is truly overwhelming. 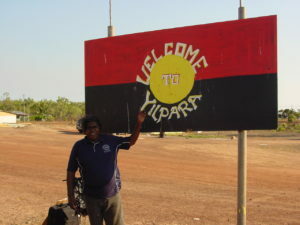 Over a year after the first recording and with two more in the can, we were just about ready to release the first CD when I suddenly had to leave Mulka and Yirrkala. I’m glad the CDs went ahead even without the work Dr. Marika and I wanted to do. It’s just a shame that they are less informative, less marketable and less significant than they could have been. I didn’t take much with me when I left Mulka, but I do have a lot of the work that we did for what became the Dhalinybuy CD. I’ll share that in a future post so that in at least a small way, you can see some of the vision Dr. Marika had for these CDs. Unfinished liner notes for what became the Dhalinybuy CD. More to come soon! Once again, the CDs are available from some didgeridoo sellers and downloads are available from Amazon, iTunes, etc. Please support the Mulka Project and get the sound of the land in your ears by buying these albums! A great story and very informative post, Randin. Looking forward to the next part! This work is extraordinary. Congratulations to you and all involved. Thank you.